Husband. Son. Brother. Coach. Champion. Growing up, Ben was an avid baseball player before being introduced to CrossFit in 2008 during his senior year in high school. 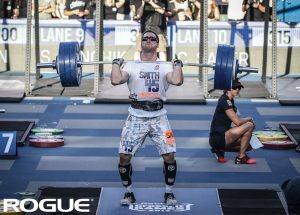 A self-taught CrossFit athlete, Ben qualified for the CrossFit Games in 2009 training solely out of his garage (youtube “Ben Smith Fridge”). He’s made it back every year since. Ben is arguably the most consistent and successful CrossFit athlete in history, with more consecutive CrossFit Games appearances than any other male athlete, 6 first place Regional finishes, and four Games podium finishes. The culmination of all of the hard work came in 2015 when Ben was crowned the Fittest Man On Earth! During his rise to the top, he managed to obtain a BA in Mechanical Engineering while also running a hugely successful affiliate, CrossFit Krypton. Ben not only continues to program for himself and his affiliate, but he’s also still training with his brothers, fellow coaches, and CrossFit Krypton athletes daily.